As parents, you are in a position to help your child or teen develop healthy self-esteem. But how?! 1. Help them develop positive self-statements. Initially, this might take the form of you making them (ex: "You were so close to getting that question correct. I bet with a little more studying, you can get there!"). The more we are able to encourage - and use - positive self talk, the more likely we are to manage stress and frustration. 2. Avoid criticism that shames or ridicules. A helpful hint here is to use "I Statements" - "I would like you to put your dirty clothes in the hamper. If you're unable to do this, the consequence will be __. I'm confident that you can do it, and doing it will mean less nagging from me!" VERSUS "Why are so you lazy?!" 3. Compliment them on things other than their looks. We want their self esteem to be based on their strengths and qualities, NOT dependent on how they look externally. For a list of 15 ways you can compliment your child in a way that builds their self-esteem, enter your email below to have it delivered right to your email! Thank you! Please check your inbox for your freebie! 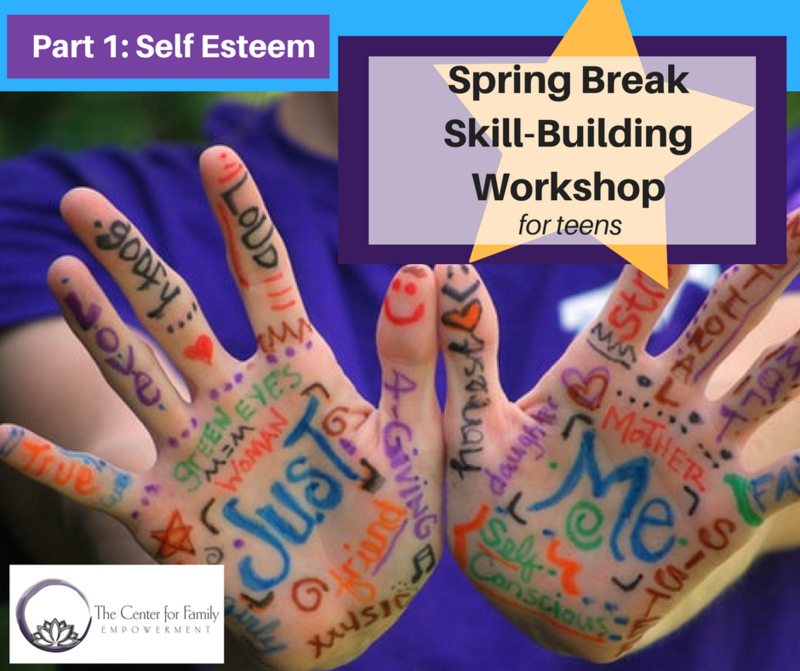 Could your teen benefit from building healthy self-esteem and claiming their strengths? If so, our SPRING BREAK SKILL-BUILDING WORKSHOP might be a great fit! Click here for more information. Newer PostCouples Therapy: Everything Was Going Good, What Happened? Older PostManaging Your Teen's Big Emotions!